Santa just might bring iPod owners something other than speakers and protective cases this Christmas. How about a breathalyzer? If you have an iPod, you can now use your music player to measure your breath's blood alcohol content before you get in your car after a few to many holiday cocktails. 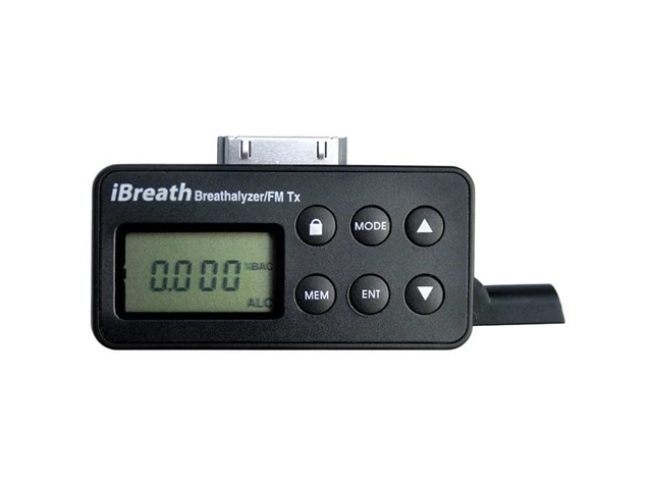 The iBreath Alcohol Breathalyzer (retails for $79) can not only save you from a DUI, but doubles as an iPod FM transmitter that transmits your tunes to any FM radio. To use the little gizmo, you just fold out the blow wand and exhale into it for at least 5 seconds. 2 seconds later, you'll know if you're within the legal limit to drive. It even houses a timer that can be set from 1 minute up to 8 hours in order to remind you when it's time to take your next test.